When it comes to feeding our children many of us feel lost. 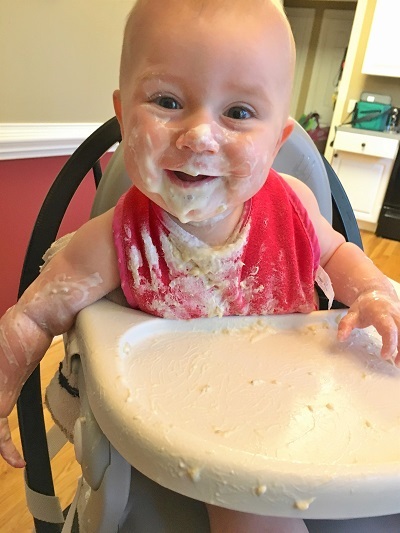 Maybe you’re just starting to introduce solids to your baby or maybe you are having all out wars with your 5 year old at dinner time. If meal times stress you out, you might be making some of these common feeding mistakes that can make meal times harder on everyone, including your kids. Little tastes of sugary or salty foods too early can increase your baby’s preference for these foods. I know it’s tempting, but you will have their whole lives to share ice cream cones or French fries with them. Try to hold off until their bodies are able to handle these foods. Instead: Serve age appropriate food. This is a good time for the whole family to reevaluate their intake of excess sugar and excess salt (usually coming from highly processed foods). It is recommended that children under the age of 2 have NO added sugar. Limit high salt foods before the age of 2 as well because their little kidneys can’t handle a high sodium load. 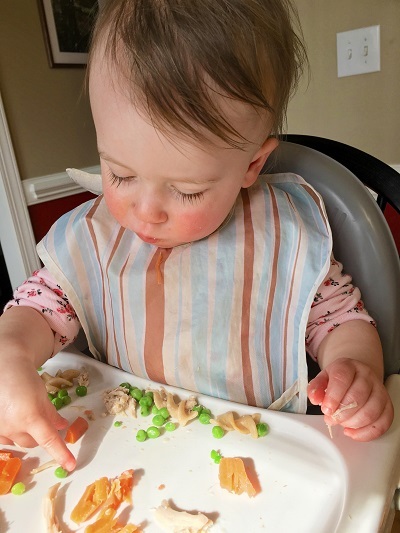 Little ones learn about food through all of their senses, which means they need to smear the food on their faces and squish it between their fingers. If you are constantly wiping off their hands or faces after every bite, this can actually lead to eating issues later on. Instead: Allow ample time for meals and let your little ones explore the food. Save clean-up for when meal time is over. Using food, especially desserts or sweets as a reward will backfire. Research shows us time after time that doing so will shift your kids’ food value system to favor the sweet treats. Translation- telling your child “if you eat your broccoli you can have ice cream” makes them think the ice cream is more important than the broccoli. Many of us do this with good intentions. We want our kids to eat healthy, but doing this on a regular basis can lead to poor eating habits. Long term studies show that kids who grew up with food as rewards or punishment have an increased risk of binge eating and emotional eating, which can of course lead to weight issues. Instead: Don’t tie sweets and other tasty foods to what or how much your child eats. Balance sweets and treats and don’t make eating vegetables (or other foods) a condition for enjoying them. And try as much as you can to not use food as a reward for anything, instead using stickers, toys, or screen time as rewards. This is another very common scenario. We mean well, we want to make sure our kids get enough to eat and we don’t want to waste food. However, simple comments like, “just one more bite, then you can get down from the table,” can teach your kids to override their fullness cues. Again, think about the long term consequences of this. We want our kids to have a healthy relationship with food. Instead: Let your child stop eating when they are full or satisfied. Encourage them to honor their hunger and fullness cues (“How does your tummy feel?” “Are you full or hungry for more?”). This is a guaranteed way to increase the pickiness of your kids! Kids need to be exposed to a wide variety of real, whole foods, over and over again. They need to see you (and everyone else) enjoying these foods (maybe many times) before they may feel safe to try it. Of course, every kid is different. But studies show that catering to food demands on a regular basis encourages picky eating. Instead: Make one meal for the whole family. Have one or two foods at each meal that you know your kid does like. 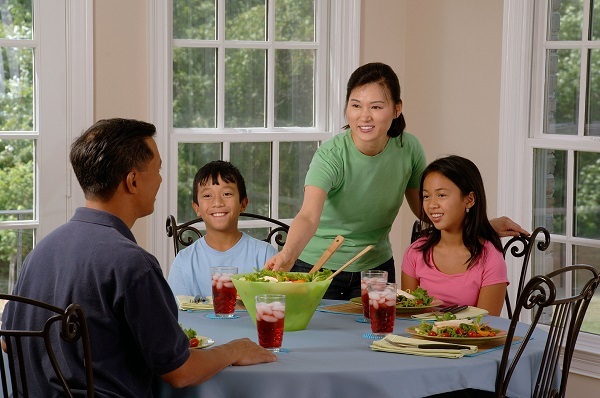 Let them see you (and other members of the family) eat a variety of foods, and try not to pressure them to eat the new foods. Just the exposure of others enjoying the food can be enough for them to eventually want to try it (it could be up to 15-20 times/exposures before they want to try it, be patient). Here are some more tips. IMPORTANT NOTE: All of these statements are assuming your child is healthy and has no feeding issues. Other rules may apply if your child has any mental or physical feeding issues. Please speak with a dietitian and/or feeding specialist for further details. For more strategies on feeding your tots to tweens, keep an eye out for next month’s blogs! 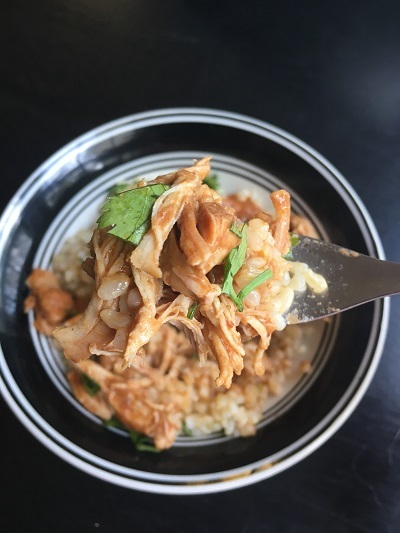 I adapted this recipe to make it super easy to throw together in the slow cooker and reduced the spiciness so that my little one could also enjoy it. The whole family will LOVE this one! In your slow cooker, mix onions, garlic, coconut milk, tomato paste, garam masala, curry powder, chili powder and ginger together. Add chicken (whole pieces, no need to chop! It will be falling apart when it’s done). Press the chicken all the way down so the sauce comes just over the top (you can do this with a big spoon or your hands). 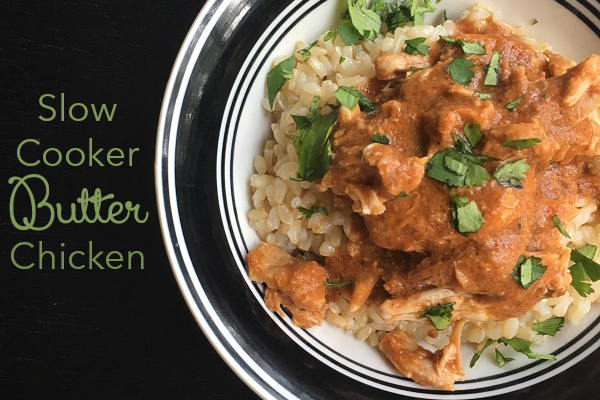 Put the lid on your slow cooker and cook on low for 6 to 6 ½ hours. Add sea salt and pepper to your liking. Chop the cilantro and sprinkle on top when serving. YUM!! 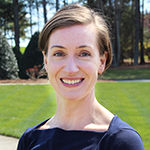 Kelly is a Nutritionist at the HCC at SAS Institute Inc. in Cary NC. She received her Bachelor of Science degree in Exercise Science from Arizona State University and her Master of Science degree in Nutrition from Bastyr University. She is a Registered Dietitian Nutritionist. Her areas of expertise include functional nutrition, health and wellness education, prenatal nutrition, food allergies and intolerances and culinary nutrition. Follow @klesageRD on Twitter.